People may or may not have heard about the word “Scrum”, but for those who have, a question most commonly asked by them might be “What can Scrum do for me to improve my business?” or “How do I use Scrum to grow?” – A topic most discussed by CEOs, CTOs, project managers, and other senior level executives in a development company or organisation when they are faced with choices of adopting a framework to better their work processes and increase the investment returns for their organisation. It is important to understand that for a business new to Agile and Scrum a lot depends upon what type of Agile or Scrum coach it hires, and how successfully the coach can help the organisation to adopt Agile principles. Agile can work wonders for you provided it is implemented in an effective way. Agile coaches ensure that business implement the framework in a proper manner. Therefore, a lot depends upon what type of Agile coach do you actually need? You may feel unsure about Agile adoption but serious enough to “give it a try” and see if it can benefit you. On the other hand, you may be aware about the benefits of using Agile but not certain how to start. It’s worth considering about the level of Agile coaching you actually need to get started. What is an Agile coach? When the question is asked to different people you’re sure to get different types of answers depending upon whom you’ve asked. The perception of Agile coaching changes from individual to individual, and from company to company. Perhaps the main reason why this happens is because there are no standard definitions explaining Agile coaching, and people have the liberty to interpret the terminology in a manner they deem correct. So, rather than trying to define exactly what an “Agile coach” is, it would be more worthwhile to comprehend what activities Agile coaching includes, and what does an Agile coach do when he/she is appointed by an organisation to facilitate or implement Scrum in their business processes. Coaching needs and activities vary from businesses to businesses based upon the type of product to be developed. However, in a typical organisation, there are three main areas where managements often decide Agile coaching is needed. An Agile facilitator may or may not possess a coaching certification from a reputed or known Scrum body. His/her primary role involves facilitating Scrum activities and mentoring Agile teams in achieving Scrum agility. The person usually engages with one or two Scrum teams – not more – and may lack experience or skill sets required for adopting and implementing Scrum to the fullest extent in the entire organisation. Small organisations, or businesses having a limited Scrum budget but still interested in implementing Scrum may opt for Agile team facilitators to introduce Scrum in their organisations before deciding upon a concrete Scrum adoption plan. 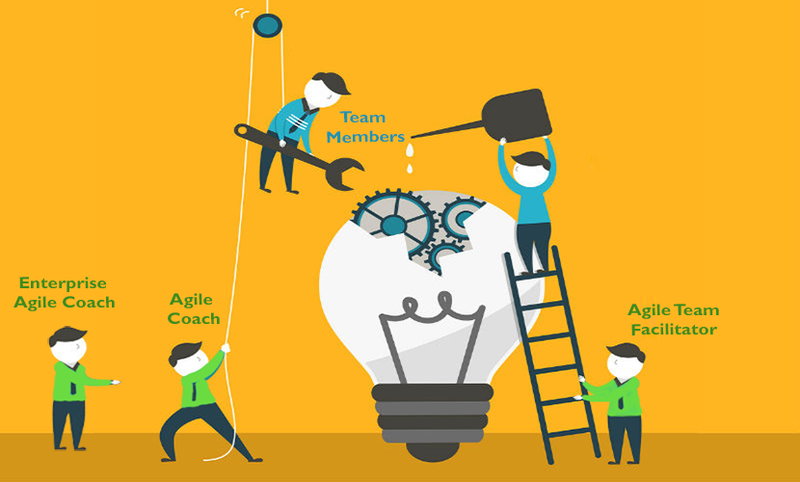 Usually, the objective of hiring an Agile team facilitator is to familiarise managements and development teams with the Scrum process and get an idea about how to go ahead with Scrum adoption, or, at times, to decide whether Scrum adoption is needed or not. An Agile coach can have one or more certifications from a well-known Scrum certification body. Unlike getting certified as a chartered account or a medical practitioner in a particular state or country, there are no formal or authorised “government recognised” Scrum certification issuing authorities. Certification availed from a few Scrum entities like Scrum.Org, Scrum Alliance, Agile Coaching Institute, etc. carry value in the Scrum market, and employers generally search for coaches who have qualified or hold certifications from these type of institutes. Agile coaches have a sound and relevant experience in at least one Agile discipline – Scrum, XP, or Kanban. They are certified Agile professionals who have achieved a high level of proficiency in their respective fields. They possess sufficient domain knowledge and coaching skills to facilitate and mentor the Scrum process in an organisation. An Agile coach trains the development team and the management in Agile principles and practices. He/she contributes at both macro and micro levels, and in addition resolves all Scrum related issues. Often, Agile coaches promote and act as Scrum ambassadors in organisations which appoint them. Businesses appoint Agile and Scrum coaches when they decide to go “all the way” with Scrum, and want to make sure they benefit from Scrum principles. Coaches are also consulted to discuss ways and means to develop better products, increase the ROI, and improve the current business processes. An Enterprise Agile coach is a person who has achieved some additional skills such as advanced systems coaching, understanding work culture, training organisations in specialised business processes, implementing change management, and creating collaboration and leadership qualities amongst individuals which “regular” Agile coaches may not possess. An Enterprise Agile coach may work at all levels in an organisation and help managements in using Agile as a strategic asset for generating consistent and reliable business value by improving current processes through Agile.